Address: Sportska bb, Borovo naselje, 32010, Vukovar, Croatia. First public football game in Vukovar was played in 1901 and organized playing of football started in the year of 1911 when high school students Ljudevit Müller, Stjepan Gruber and Franjo Gruber formed Hrvatski djački nogometni klub Sremac (Croatian student’s football club Sremac). In the same year Djački športski klub Šparta (Student’s sports club Šparta) was formed and rivalry between the two teams developed almost immediately. Today city of Vukovar have seven registered football clubs: HNK Vukovar 1991., NK Vuteks-Sloga, HNK Radnički, ŠNK Dunav Sotin, HNK Lipovača, HNK Mitnica and HNK Borovo. Since the Bata days and formation of first sections and social clubs, sport has always been an important part of everyday life in Borovo naselje. Czech industrialist Tomáš Bat'a, the owner of ‘Bata’ Borovo factory, who was socialy aware and progressive industrialist, encouraged numerous activities of his workers of which sport was one. From the very beginnings and formation of Borovo settlement sport sections and social clubs were formed. Football, tennis, boxing, handball, volleyball, kayak, swimmning and waterpolo, basketball, table tennis, karate, chess... are just some of the sports in which Borovans participated and grew up with during years. As Czech industrialist Tomáš Bat'a was establishing his factory and a settlement for the workers in 1931 football was on its way too. Workers first played at the so-called "Temza", which was a land area, near Danube river, near today's stadium. The club was established on 31 of January 1932 as SK Bata Vukovar. The team was formed in 1931 as it can be seen in 60 Years of RNK "Sloga" Vukovar 1926-1986 monograph where on page 53 it was mentioned that a football game was played, on 24th of September 1931, between S.K. "Bata" and S.K. "Šparta II". Result was 2:2. Then the Club also used the name of V.A.S.K. (‘Bata’)(Vukovarski amaterski sport klub - Vukovar amateur sport club ‘Bata’), for some time, and was a football team of ‘Bata’ Borovo factory. After building of Sports Stadium started in Borovo and opening of football field in 1933 the name V.A.S.K. (‘Bata’) was dropped and in 1934 adopted the name B.A.T.A. S.K. (Borovski amaterski telovežbački atletski sportski klub - Borovo's amateur gymnastic athletic sports club). Customary name used was SK Bata Borovo. The Club was an advertising team of ‘Bata’ Borovo factory with representative team (blues), reserves (whites), black team, multicoloured team and juniors team and in 1937 had formed a Ladies team too. SK Bata Borovo competed in Championship of Osijek Sub-federation (1933-39) and their best success before the World War II was in the 1938/39 season, winning 1st place and gaining a chance to participate in qualifying games for promotion to Federal League. In the thirties of the last century the biggest rivals of SK Bata Borovo were Osijek's clubs, Slavija and Olimpija in Osijek Sub-federation and BSK and Jugoslavija from Belgrade and Slavija from Sarajevo in Serbian football league. In the year of 1939 there was a complete reorganization of football in Yugoslavia. On the basis of a federal system a completely autonmous nacional federations were formed inside one high Yugoslavian football federation. Nacional federations played their leagues after which Nacional League was played. In the 1939/40 season Nacional League was played by 3 best placed clubs from Croatian-Slovenian football league and 3 best placed clubs from Serbian football league. In the 1940/41 season 4 best placed clubs from Serbian, 3 from Croatian and 1 from Slovenian leagues were supposed to play Nacional League. After reorganization SK Bata Borovo was competing in Serbian football league and in 1939/40 season finished 6th and was placed 6th in the season 1940/41 which was never finished because of the Germany's attack on Yugoslavia. During the years of World War II HSK Bata Borovo continued activity by playing in football league of Independent State of Croatia (1942-1944). The Club was, at that time, under the guidence of František 'Pan' Koželuh (1887-1969), a renowned Czech coach who will stay in Borovo naselje for the full eight years (1940-1948), after which he went back to his hometown of Prague. In 1945, after the World War II ended, the Club continued as FD Bata and then in the same year changed name to SFD Slaven. Football section of SFD Slaven was formed by the players of HSK Bata Borovo, Blagoje Stanković "Bagi", Zvonko Vukelić, Nikola Perlić, Antun Nagyszombaty, Tonča Rok and others. From the year of 1946 Slaven competes in Osijek District Championship and successfully competes in Slavonian cup. After becoming Champions of Osijek District and winning in qualifying games, Slaven advanced to Croatian football league where in a series of good results secures participation in qualifying cup to enter 3rd Federal division for the year 1947. In the 1947/48 season Slaven plays in newlyformed CFF Zone (Slavonian football zone) and in 1948/49, 1950 season Slaven competes in Croatian football league and then in 1951 season competes in Croatian football league - North. In the seasons 1952 and 1952/53 Slaven again competes in Sub-federal championship of Osijek Football District and as the best club in that competition secures participation in Croatian-Slovenian league for the 1953/54 season where at the end finishes fourth with a score of 20 8 6 6 46:28 22. At Annual General Meeting which was held on December 19th 1954 SFD Slaven changed name to NK Borovo. In the 1954/55 season, competing in Croatian-Slovenian league FC Borovo achieves excellent 3rd place behind FC Split and FC Rijeka with a score of 22 13 1 8 38:25 27. These are the times of coach Mijo Kiš from Osijek and FC Borovo under his guidance achieves another success in the 1955/56 season with inclusion to 3rd Football Zone and after winning 1st place opens up a path to 1st Federal League but fails to advance after qualifying games and then stays in the Zone. In those qualifying games from the year 1956 with FC Borovo there were teams: FC Vardar (Skopje), FC Lokomotiva (Zagreb) and FC Lovćen (Cetinje). The entrants to 1st Federal League were FC Vardar (Skopje) and FC Lokomotiva (Zagreb). In 1956/57 season Borovo won a 1st place in 3rd Football Zone for the second year in a row and again entered qualifying for promotion into 1st Federal League but missed its chance to advance. That year, 1957, in qualifying games participants were FC Željezničar (Sarajevo), FC Split, FC Borovo and FC Radnički (Kragujevac) and in the end a decisive was one repeated game. The game in which Borovo needed atleast a draw with Radnički. First game between the teams was cancelled by Football Federation of Yugoslavia because of Radnički’s players acts of roughness, which referee Petrovski tolerated. A unique case, because of roughness cancelled game of YU-football, ended with the same result as the first one, 2:1 for Radnički and that made it possible for FC Split to, on a better goal difference, enter 1st Federal league with already qualified FC Željezničar. Next season, 1957/58, Borovo is again in 3rd Football Zone and at the end of the season finishes solid 7th. In 1958 re-organisation of the league is made and Borovo, through additional qualifications, enters newly formed 2nd Division West where in 1958/59 season finishes 11th and goes down to a Zone league. New season of 1959/60 is a succesful one but after winning 1st place Borovo couldn't go past FC Čelik in qualifying games and stays in Zone league. 17th of July 1960 first qualifying game for entering a 2nd Division was played in Zenica, between FC Čelik and FC Borovo, in front of 10,000 spectators at the old stadium ‘Blatuša’. FC Borovo started well and surprised the home team by leading 0:1 with the goal from Obren Ekmedžić. Dominating over the big part of the first half Borovo successfully warded off a strong team of FC Čelik. Second half was all about FC Čelik which turned the game and at the end won 2:1 with Božidar Malešević and Alojz Renić being scorers. The return game in Borovo naselje was played on 24th of July at the ‘Borovo’ stadium, was refereed by ivota Vlajić from Belgrade and in presence there was also more than 2,000 FC Čelik supporters who travelled from Zenica in a specially for that occasion organized train. The game ended 0:0 in controversial circumstances and with two Borovo players in hospital, after suffering injuries on the field. The score of 0:0 was enough for FC Čelik to progress into the 2nd Division. In these two games FC Borovo played in this line-up: Jordan Gligorijević, Omer Bajramović, Stjepan Rastija, Miodrag Marković, Nikola Backović, Pavao Rajzner, Mile Stamenković, Milan Čop, Ivan Gotal, Ištvan Gordoš and Obren Ekmedžić. Season of 1960/61 is another succesful one and Borovo, after winning 1st place in Zone and qualifying games, goes back to 2nd Division. On the photograph NK Borovo, 2. Savezna liga, 1967. Standing: Edo Bulić, Tomica Djordjević, Slobodan Neović, Željko Jurčić, Petar Popović, Babić and Miroslav Šakić. Squatting: Mihnjak, Ivan Gotal, Dragun, Želimir Vilhelm, Zvonko Popović and Rudolf Vilhelm. The 1960’s and up to 1972/73 season have seen the club competing in 2nd Federal league West and North respectively. In that period there were great results from the years of 1961, 1968, and 1972, when FC Borovo played well in Maršal Tito Cup and reached quarter-finals on three occasions but eventually lost to FC Varteks Varaždin (0:1, 1961), FC Crvena zvezda Belgrade (0:2, 1968) and FC Dinamo Zagreb (1:2, 1972). All three of them later played in the final. One of the most interesting games from that period was, by all means, a 2nd Division game played in 1966 between FC Borovo and FC Čelik. The game was refereed by Lado Jakše from Ljubljana, the well known first league football referee of that time in Yugoslavia. FC Čelik was fighting with FC Sloboda Tuzla to finish top of the league and enter 1st Federal league and for FC Borovo it was a chance for a "revenge" because of the loss suffered in qualifying games 6 years earlier. In front of a capacity crowd at "Borovo" stadium, after another great battle, FC Čelik won by 1:0 and the scorer of the only goal in that game was Milorad Lazović, with a header, in 83rd minute of the game. 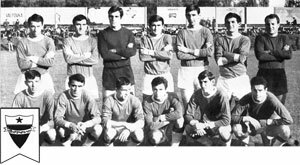 The year of 1973 can be considered a turning-point in Club’s activity up to that moment, because at the end of the 1972/73 season FC Borovo was relegated from 2nd Federal league. From then on up to the year of 1991 the FC Borovo played in Croatian football league North and East respectively which was a 3rd level and then a few years before the break-up of Yugoslavia it was a 4th level of leagues pyramid. Final results score of FC Borovo in 2nd Federal league of Yugoslavia is: games played: 391, wins: 127, draws: 114, lost: 150, goal difference: 482:596, points: 368. From the year of 1991 and the Croatian Homeland war, when city of Vukovar was under siege for three months and suffered great devastation and loss of life, up to the 2005/06 season Club was not active and just before the start of the 2005/06 season the Club was reactivated and the tradition of Football Club Borovo is continued. Club players Nikola Živković, Domagoj Čović and Boris Pšenica were killed in Croatian Homeland war. After reactivation the Club was, at the start of the 2005/06 season, entered into competition in 2nd Vukovarsko-srijemska county league - Vukovar Football Centre - Group A, under the name of HNK Borovo. In 2nd Vukovarsko-srijemska county league - Vukovar Football Centre HNK Borovo in 2005/06 and 2006/07 seasons achieved two second places. In 2007/08 season, under the guidance of coach Vjekoslav Karaula, wins the League and promotion to 1st Vukovarsko-srijemska county league (the equivalent to 5th level of Croatian Football League pyramid). Season 2008/09 in 1st Vukovarsko-srijemska county league was a turbulent one and Borovo ended it at 11th place after securing a spot and survival in the very last round, with 2:1 home win over FC Jadran Gunja. After playing 17 rounds, the Club was forced to withdraw from the second part of the 2009/10 season of 1st Vukovarsko-srijemska county league due to lack of financial means. Because of that the Club had to start 2010/11 season in the 3rd Vukovarsko-srijemska county league - Vukovar Football Centre (7th level of Croatian Football League pyramid) going back to the lowest grade of competition, consequently, where it all started back in the year of 1933 when the Club competed for the first time. 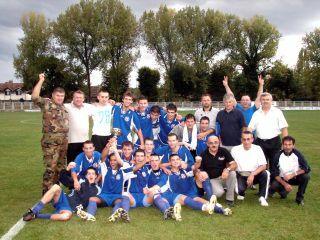 On the photograph HNK Borovo, winner of Vukovar Football Centre Cup, 2006. After turbulent 2009/10 season when the club was almost dissolved, problems did not go away. Because of chronic shortage of money the club was in constant dire straits and as a consequence had organisational and competetive problems. Some of the games in 2010/11 season were played with a minimum allowed number of players (seven) and one game wasn't played at all (16th round, FC Borovo vs FC Sloga Pačetin, later registered 0:3) because there was not even seven players available. The greatest omission (?) of the season was in 18th round vs FC Tompojevci when Borovo fielded two players for which the match delegate established that they were without sports identity cards, thus not eligible to play. In spite of warnings coming from match delegate the two players in question played (!). Because FC Tompojevci did not lodge a formal complaint the game was registered with the actual game score of 1:2 and Borovo was reported to disciplinary commission. In 19th round (FC Opatovac v HNK Borovo) the game was interrupted in 46th minute (with score at the moment of interruption being 8:0) due to one Borovo player getting injured, leaving them with only 6 players. The game was registered with the score attanined in the moment of interruption. The 2010/11 season Borovo finished last, 8th, with a score of 21 2 2 17 14:73 7. During 2011/12 season the club was stabilised in some measure, playing in 3rd Vukovarsko-srijemska county league and finishing 5th, in 2012/13 season 9th and in 2013/14 6th. 1983. FC Borovo received CFF award: ‘Trofej podmladka HNS-a’(1). 1984. Josip Kezdi received CFF award: ‘Trofej podmladka HNS-a’. 1991. FC Borovo received a CFF’s Golden plaque for work with youth categories. HNS-CFF.hr; ZNSVS.info; 50 godina nogometa u Slavoniji, Osijek, 1956.; Godišnjak FSJ 1956/57, FSJ, Beograd, 1957.; Godišnjak FSJ 1957/58, FSJ, Beograd, 1958.; Fudbalski kup Jugoslavije 1947-1974., FSJ, Beograd, 1976.; Sergej Gerc, Crna strana YU nogometa, Centar Gospić, 1982.; Sto Godina Nogometa u Hrvatskoj, NSH, Zagreb, 1983.; 60 godina RNK "Sloga" Vukovar 1926-1986, RNK "Sloga" Vukovar, 1986.; Hrvatski Nogometni Savez 1912-1992, HNS, Zagreb, 1992.; Nogometni leksikon, LZMK, Zagreb, 2004.; Ante Duić "Dunja", Borovo: od trnja do zvijezda i ..., Vukovar, 2005.; Vlado Horvat, Vukovarska društva, Gradski muzej Vukovar, 2007. (1) Croatian Football Federation (CFF) established the award of ‘Trofej podmladka HNS-a’ on 10th of December in the year 1977 and is awarded every year to individuals and organizations, societies and institutions respectively as a reward for lifelong work in football and exceptional contribution in development of football in Republic of Croatia. Trophy (a figure of a footballer) is in bronze with a marble pedestal and is a work of academic sculptor Marijan Zaradić. Content of this unofficial website can be freely taken with condition of providing link to the original page from where the it is taken.